How did you decide to be a member of your corps? I had a friend that marched in 2002, that loved the experience, so I decided to go. I also had a neighbor that marched with the Glassmen in the late '90s. What first attracted you to the drum corps activity? The speed, the excitement, having it be a bigger, faster, and better version of what I loved to do in high school. What advice would you give to young people who want to march? Don't give up, if you're told that you can't march at your favorite corps, go somewhere else, get experience, and then try out again the next year. Don't just do nothing. Do you have any favorite road anecdotes? Compression shorts and/or Gold Bond The last good book I read: Wow, it's been a while since I've read a book, but if you can ever read J.R.R. Tolkiens "Lord of the Rings," I'd highly recommend it The last great film I saw: "A Beautiful Mind" Where I go to school and what I'm studying, if applicable: Michigan State University -- astrophysics and physics Jobs I have/have had: Dishwasher, concessionist at a movie theatre, cashier, teaching assistant for undergraduate astronomy Three CDs I'd want on a deserted island: Muse, "Aboslution"; DCI, 2000 Finals; Chevelle, "This Type of Thinking (Could Do Us In)" My favorite TV show: "Adult Swim" ("Family Guy," "Futurama," etc) How do you "blow off steam?" 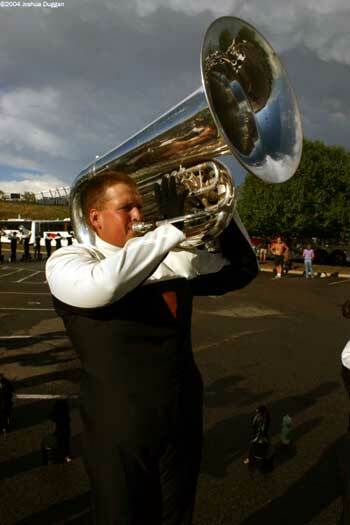 Listen to music What has been your formative drum corps moment? Making finals in 2004, the whole year's hard work paying off Best drum corps show ever: SCV 1989 What are you most looking forward to about the summer? Being with all the friends that I've made, that I only get to see once a month during the off-season Best thing about being in a drum corps: Performing Worst thing about being in a drum corps: Not being able to do the internships that I've been told I have to do for school. During tour, the best part of the day is: The performance at night, best high in the world During tour, the worst part of the day is: Waking up Favorite drum corps personality and why: Brandt Crocker -- he's the "voice" of DCI What I want to be when I "grow up": A scientist that discovers something that we didn't know about before.